Cells At Work! is back on the job. 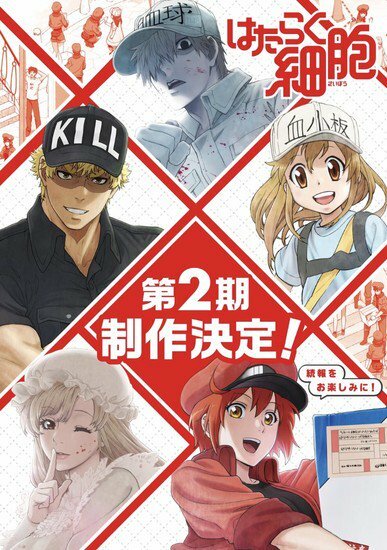 The charming anime about anthropomorphized human cells returns for a second season, according to the Cells At Work! Twitter account. The 13-episode first series originally aired beginning in July 2018 and is available on Crunchyroll. Based on the ongoing manga of the same name, Cells At Work! describes what happens to the more than 60 million cells inside the human body. Kodansha Comics USA publishes the English language version of the manga. Studio David Production produced the anime adaption, licensed in North America by Aniplex of America. Kenichi Suzuki (JoJo’s Bizarre Adventure, Drifters) directed the television anime at David Production, and Yuuko Kakihara (Tsuki ga Kirei, Persona 4 The Animation) was in charge of series composition, and both Suzuki and Kakihara penned the scripts. Takahiko Yoshida (Welcome to the NHK, Yowamushi Pedal) designed the characters and was also credited as chief animation director, while Kenta Mimuro was credited as cell character designer, prop designer, and animation scene animation director. Keiko Tamaki was credited for sub-character design. Kenichiro Suehiro (Re:Zero, Girls’ Last Tour) composed the music at MAYUKO.